Working across a whole system that delivers better outcomes for every pound spent. 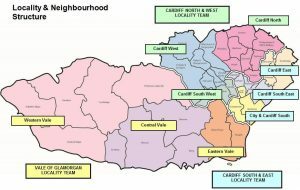 Within Cardiff and Vale of Glamorgan there are three Localities: Cardiff North & West / Cardiff South & East / Vale of Glamorgan. Each Locality has three Primary Care/GP Clusters. Local authorities and partners work within Neighbourhoods, which are geographically the same as Clusters. To find out more about each neighbourhood/primary care cluster, please click on the map below or click here.